Programming Note: The blog returns Monday! 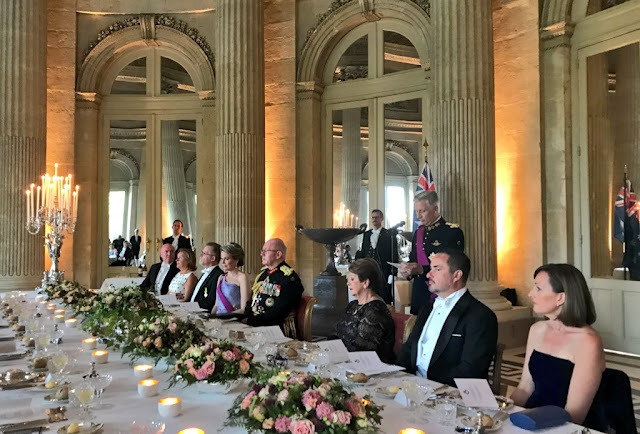 Only the very grandest of settings will do for a state banquet! (This is at the Castle of Laeken.) 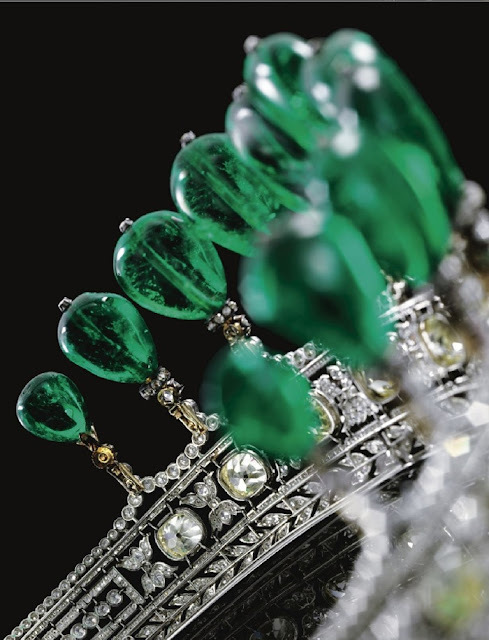 Mathilde did not bring the grandest of tiaras - not a surprise, she tends to adjust her bling based on the guest - but longtime readers will already spot what I love here. PURPLE! Purple on top of purple, even. 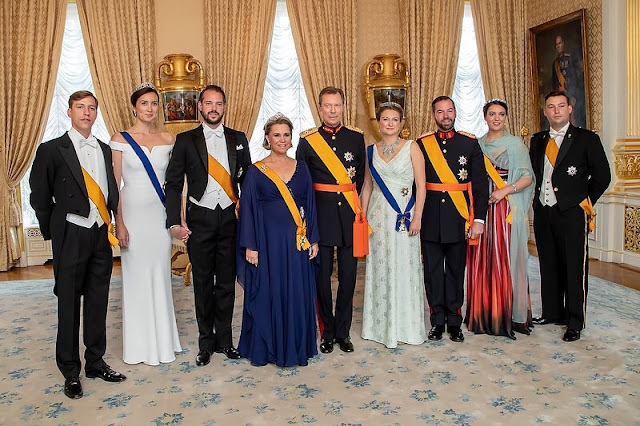 The dress almost looks blue here, it's very much on the cool violet/periwinkle end of things while the sash of the Order of Leopold is much warmer. I shall not let that get in the way of a good purplefest. She added in her diamond butterfly brooch, diamond and pearl earrings, and the Wolfers Necklace Tiara from Queen Fabiola. 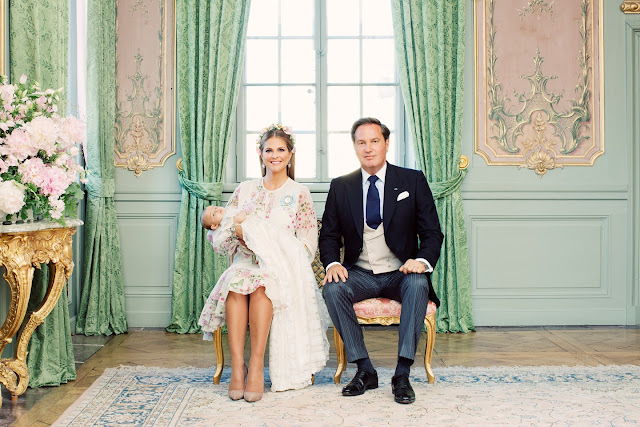 The dress is custom Armani Privé, seen previously at King Carl Gustaf's 70th birthday banquet in 2016, when she also wore the Wolfers Tiara. Her Laurel Wreath Tiara would have been a good one to try here. Going backwards in time, the Queen's new Natan for the welcome ceremony has the delicate floral embroidery I love, and she's pulling her accessory color from those details, another thing I love. So it took me a while to figure out what wasn't clicking here for me: I think it's the forehead placement of the hat. I'd love to see her repeat this dress and pull a different accessory color out of the florals. ...you are absolutely correct. 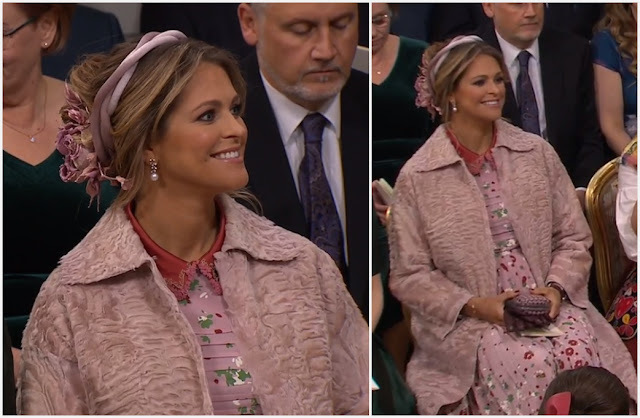 She debuted this during the couple's state visit to Canada earlier this year; the designer is Canadian. I like this one on her, I really do. The Duke and Duchess of Sussex joined the Queen yesterday for the presentation of the Queen's Young Leaders Awards at Buckingham Palace. Prince Harry also attended this event in 2017 and 2016. While the Queen went with her usual floral print (and a brooch, which you can check out at the Vault), the Duchess chose a custom Prada outfit. 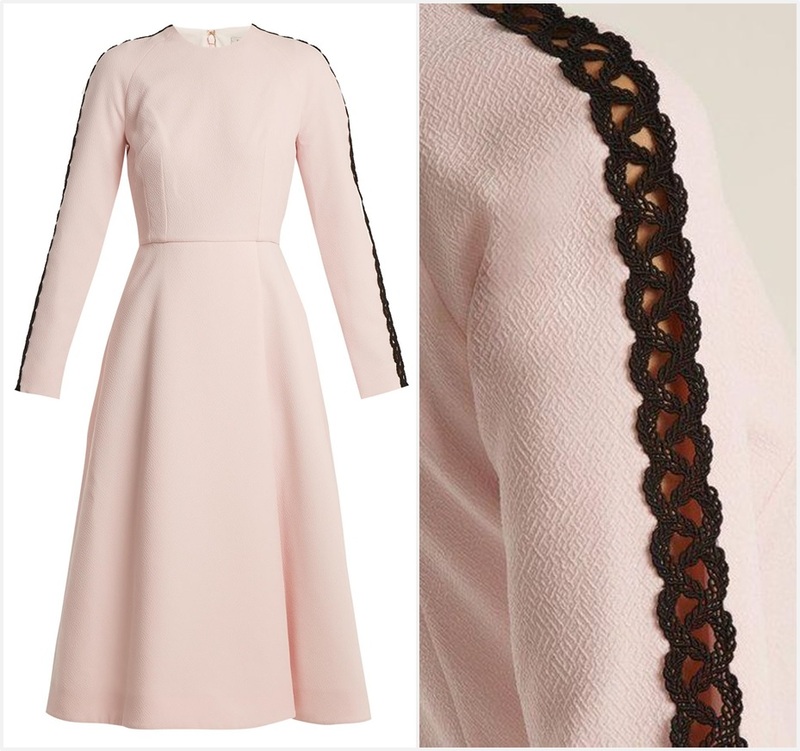 Pink and buttons and belted and asymmetric, sort of a combination of every other outfit she's worn since the wedding. Bless that asymmetric skirt, valiantly pulling those covered buttons into a new century. 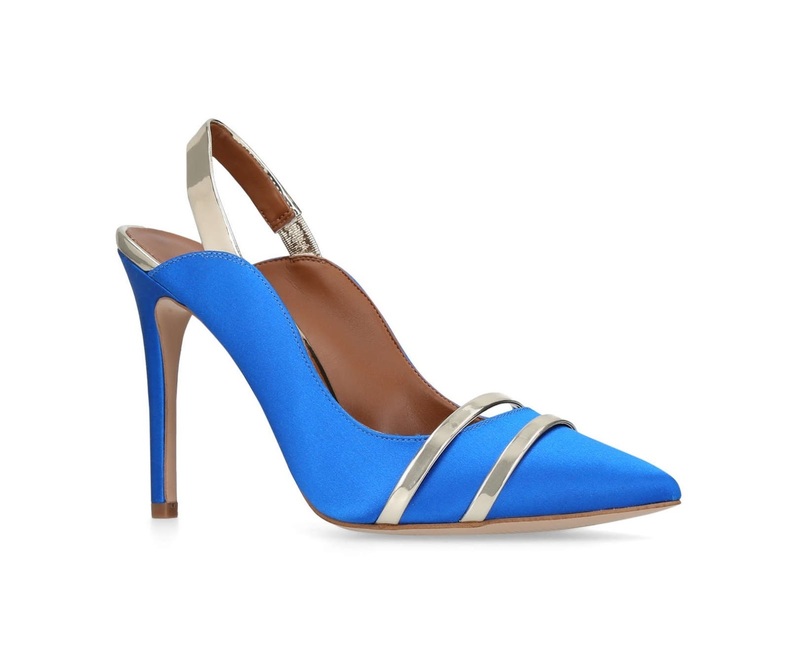 Yes, I say bless the asymmetric skirt and bless a shoe that's not a plain black pump. Cut outs and a little bow at the back, yesssssss. Accessories on point as always. 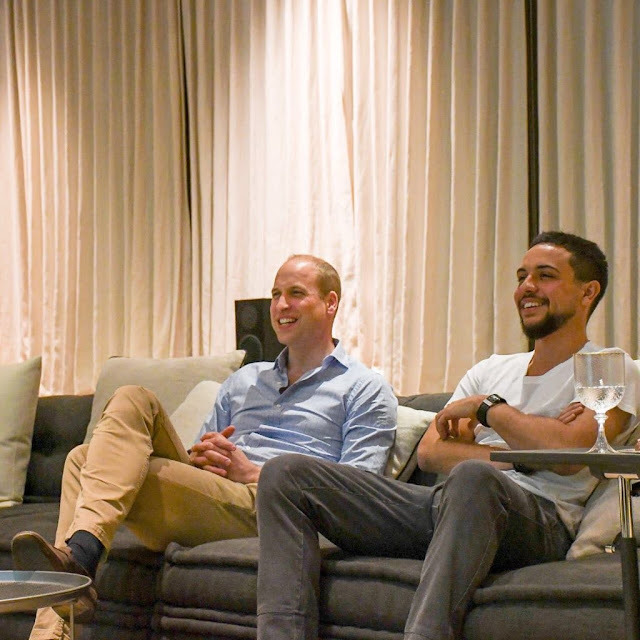 I did say the Sussexes, so also the Duke was there. He wore a suit. 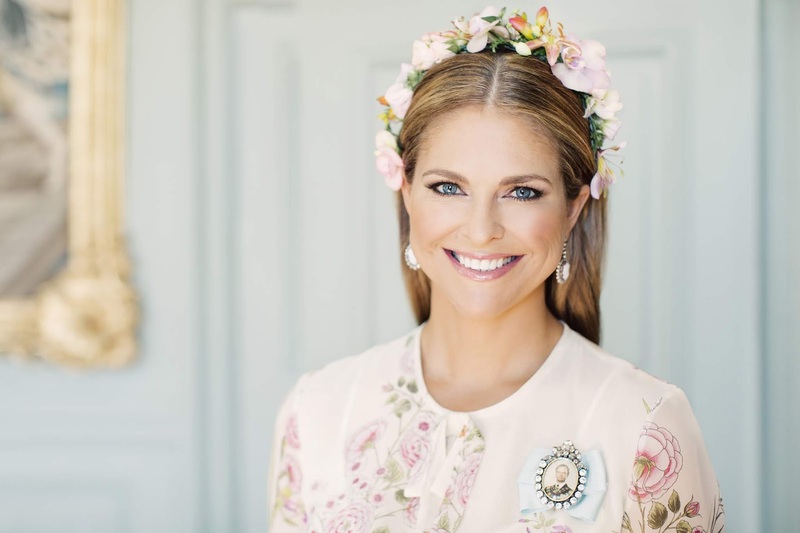 --ICYMI, we wrapped up Days 4 and 5 of Royal Ascot over at the Jewel Vault, with appearances by Princess Beatrice, Princess Haya, Autumn Phillips, and Lady Sarah Chatto. (Day 4 here, Day 5 here.) Also, there was polo and the return of the Duke of Edinburgh. 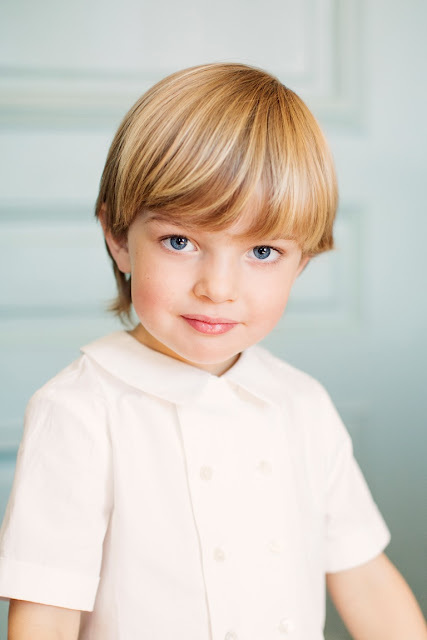 --The Cambridges announced a date and time for the christening of Prince Louis: July 9, to be held at the Chapel Royal, St. James' Palace, at 4 pm. --And finally: PUPPIES! 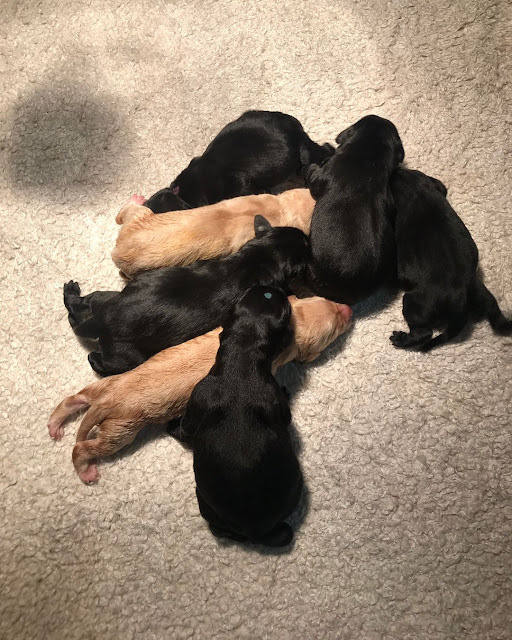 Seven Labrador puppies were born at Villa Eikenhorst, home of King Willem-Alexander, Queen Máxima, and their family. They announced on social media that the family's dog, Nala, had three females and four males. They'll keep one and find homes for the other six when the puppies get a bit older. 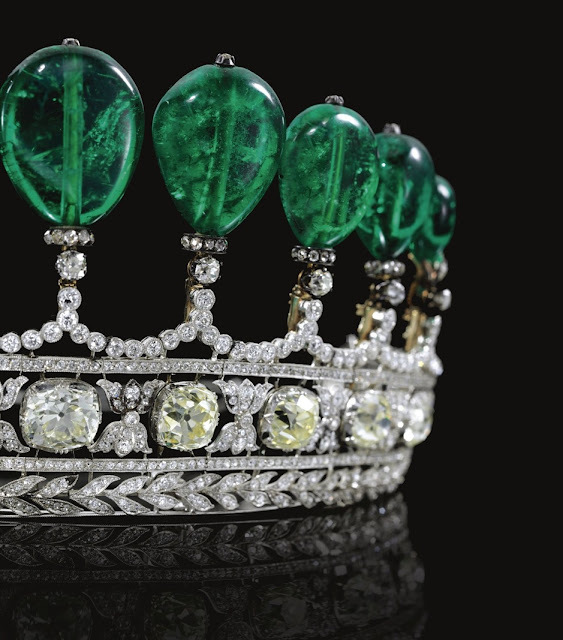 If you can start your week with tiaras, do. Right? 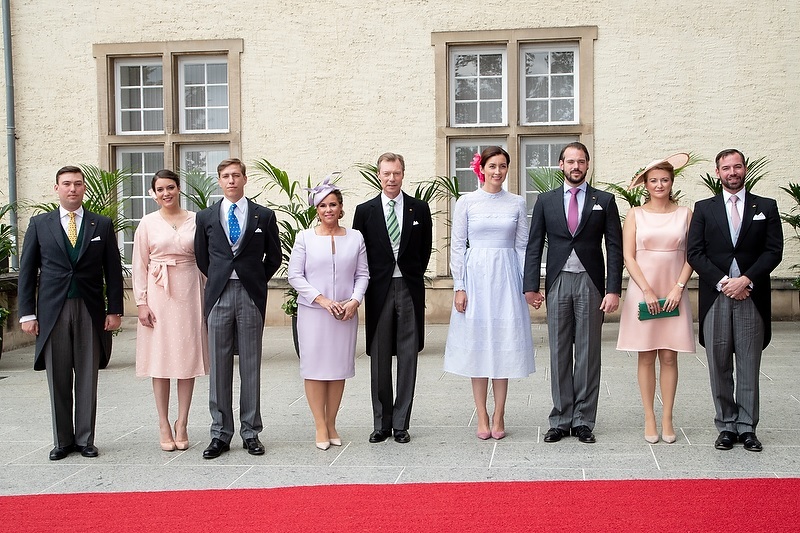 Luxembourg's grand ducal fam provided over the weekend during the festivities for National Day. We'll start with some less shiny toppers, though: hats at the annual Te Deum. Two hats and two flowers, to be more precise. 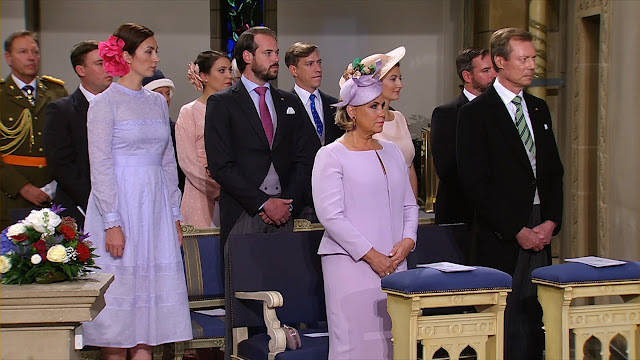 I love Grand Duchess Maria Teresa when she's in sleek and simple mode; I love her doubly so when she decides to do it in purple. She's my Te Deum winner by a country mile. It's a liiiiiiitle weird to me that Princess Claire repeated this Vilshenko dress from National Day two years ago? Like...there aren't that many events in Luxembourg you attend, you know? Anyway, I will give her credit for the improvement of a magenta flower over the pale flower she wore in 2016. Maybe she realized she needed a redo. I'd like to give Princess Stéphanie some credit for her hat interest, too, but that dress is making it real hard. She and Guillaume recently announced that they'll be moving to London for some post-graduate studies. I hope she'll carve out some quality shopping time, too. Stéphanie did bring out the jumpy claps for the evening gala, I will say that. TIARA TIME! Four tiaras! Not a shabby turnout at all. All National Days should have a gala, internationally. Make it so. 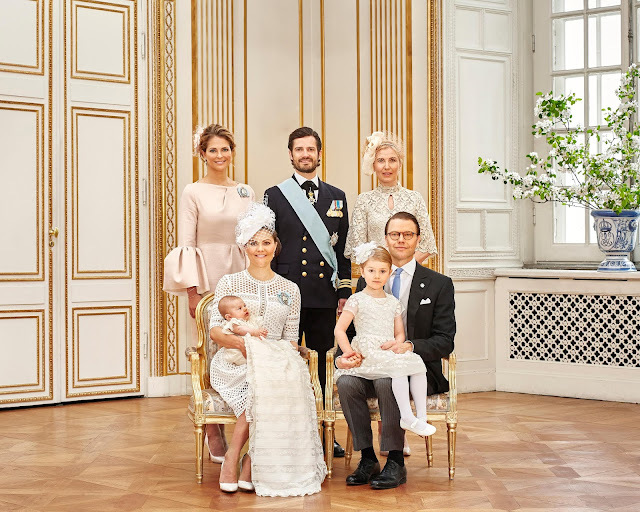 Behold, the aforementioned jumpy claps: Princess Stéphanie didn't just wear the Luxembourg Turquoise Tiara, she added the entire massive necklace from the family collection. A good way to make the small tiara stand out, and also, YUM. Princess Claire is once again wearing Grand Duchess Marie-Adélaïde’s Tiara, which she debuted at the 2016 National Day gala. Her chic white dress is Alexander McQueen (the same style was worn with a tiara by a Danish noblewoman at Crown Prince Frederik's 50th birthday dinner). Stéphanie and Claire, by the way, are both wearing the Order of Civil and Military Merit of Adolph of Nassau. It's Luxembourg's second highest order. Princess Alexandra's got a lot going on here, with her Elie Saab of many colors and the sash (the Order of the Gold Lion of the House of Nassau, like her mother and brothers) and the shawl. She chose to bring out the blue with the Aquamarine Bandeau Tiara. 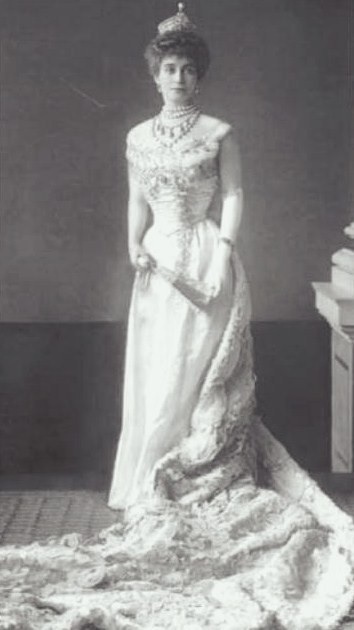 The recent break in the Grand Duchess' streak of Belgian Scroll Tiara appearances - at the Danish birthday party - proved to be very short-lived indeed. She's right back to her Scroll antics, complete with what I believe is another Elie Saab gown. My affection for my formerly favorite Lux tiara is waning due to lack of variety and it's concerning. I'm sure Maria Teresa is terribly worried about it, too. Yesterday was Ladies’ Day, or Gold Cup Day, the halfway point in this annual festival of hats and usually home to some of the best millinery we see throughout Ascot. Did the royal ladies rise to the occasion? Judgment awaits, and you can check out the Queen in pink here. Sophie did her duty and fulfilled another crucial Royal Ascot requirement yesterday: the ritual Muppet sacrifice. Minus the very visible base in the close ups, though, this Jane Taylor hat is one former Muppet I can get behind. 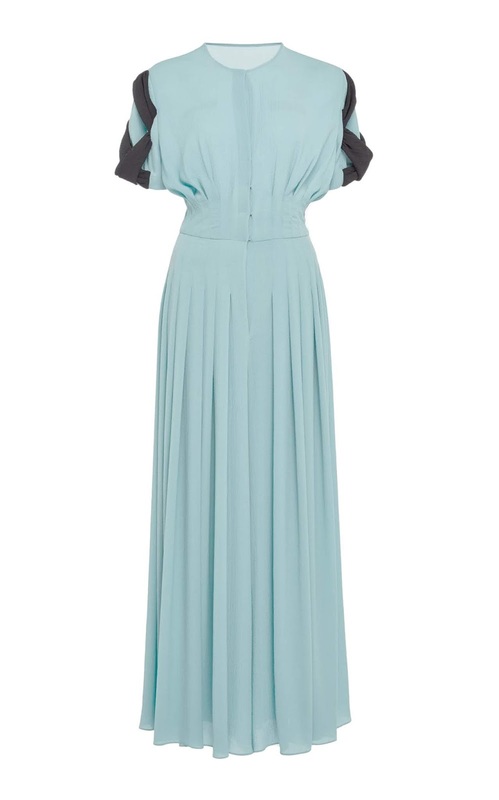 Love that she leaned into lavender for the accents with this Suzannah dress. The hits just keep rolling in for Beatrice. This striking black and white Jonathan Simkhai dress is great on its own and even better paired with this Sally-Ann Provan hat. She wears this saucer shape so well. Eugenie…could have kept that streak going for herself if she’d consulted the Day 2 outfit of Autumn Phillips for a little advice first. 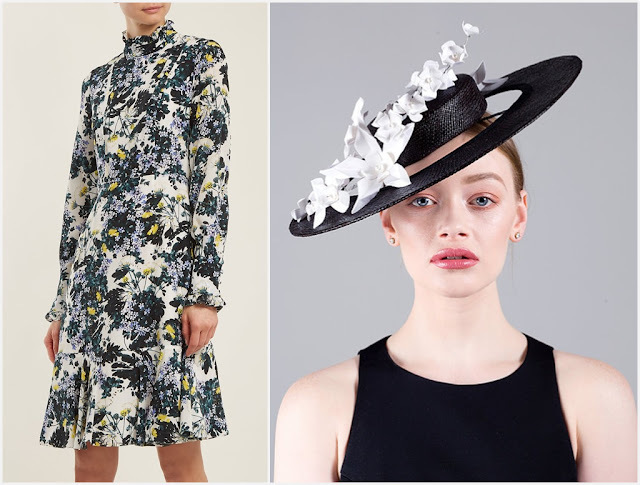 The boater hat from Sally-Ann Provan definitely lives up to the Ladies’ Day expectations in true planetary ring fashion, for sure, but the Erdem dress needs something simpler to work. It’s a competition and nobody wins. Green hat, loads of emeralds, and a burnt orange dress. Green and orange has to be one of my least favorite color combos. Except that…a) it’s Birgitte! 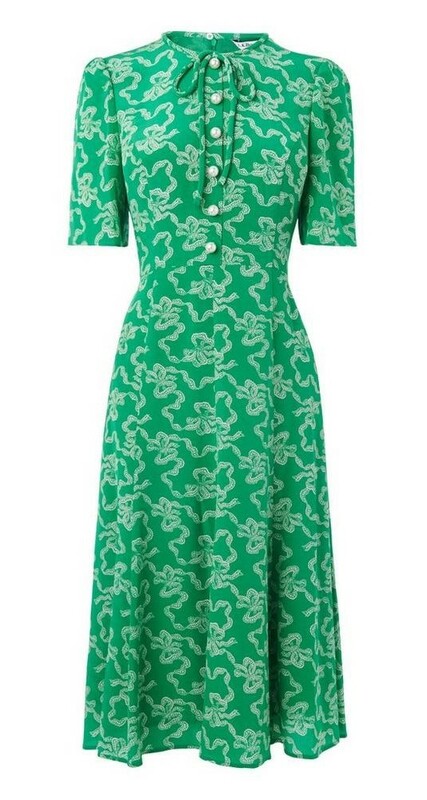 That’s the last person I’d guess would come out with this combination so yay for surprises, and b) that’s a great shirtwaist dress (she knows it, too; she wore one in blue on Day 2), and c) EMERALDS. 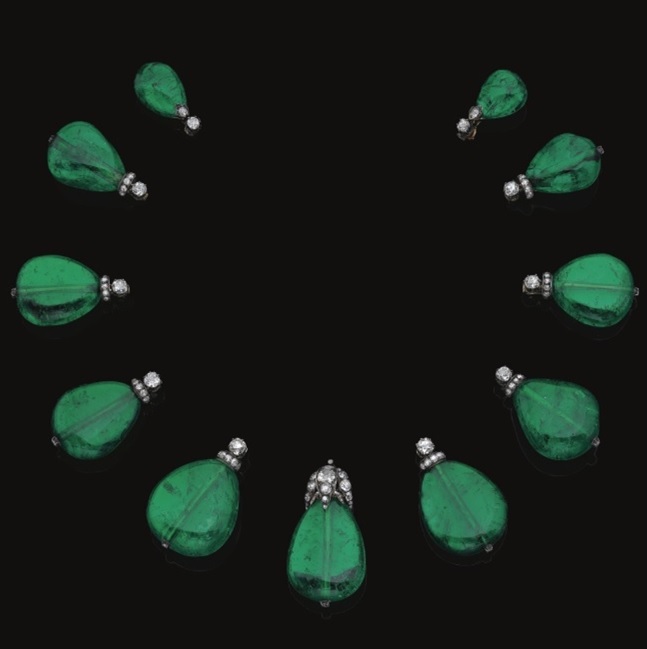 Big emerald drop earrings and pearl necklaces with emerald beads, part of a wedding present to Princess Alice from Queen Mary. Yum. I'm not hitting absolutely everyone here, but BONUS ROYAL ALERT: Hi Serena! The Duke and Duchess shared a carriage with the Earl and Countess of Snowdon. There is, as always, much potential in what we can see of Serena’s outfit. Who's taking home your prize ribbons for Day 3? So we've got ruffles at the collar, ruffles on the sleeves, a tie at the waist, a whole lot of pattern, and a hat with an ornament stolen from an aquarium...and it's a success?! 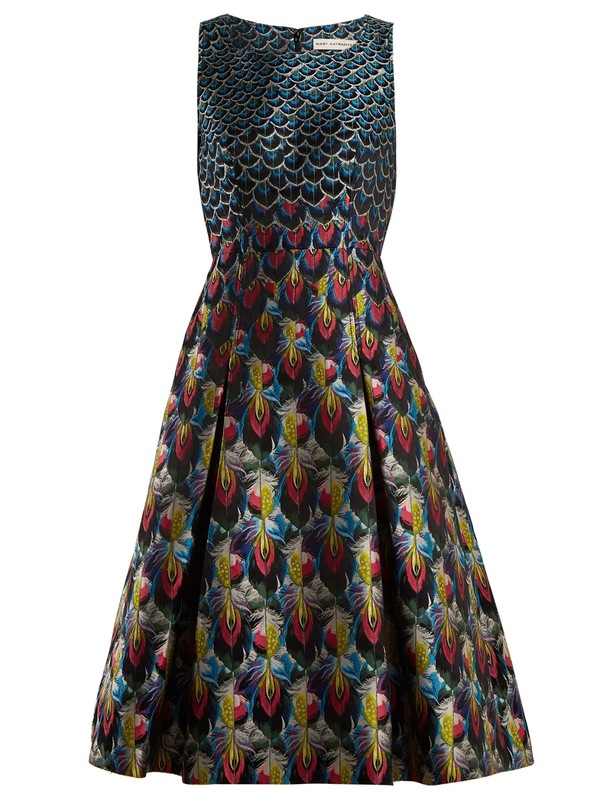 The hat's got just enough solid color space and clean enough lines to balance the print on this Beulah London dress. Autumn always makes it work. At least once an Ascot, Sophie will give us something worthy of a My Fair Lady remake. She's good like that. Her first attempt for 2018 comes from Jane Taylor (of course) and is paired with a new jumpsuit from Emilia Wickstead (of course). Yes, I said jumpsuit. Those are allowed in the strict Ascot dress code and she's taking advantage. For better or for worse. It's hard to tell that it's a jumpsuit, and with that glorious millinery distraction in place, you can just glaze on over that fact, if you like. Like me. Now we'll steer away from Ascot for a sec. When the York sisters left the racecourse on Monday, their day wasn't over. Nor was their streak of sartorial excellence. They hit up the annual Serpentine Summer Party at The Serpentine Gallery and let their hair down (and up) in two outfits perfect for the arty occasion. As ever, I recommend abandoning all jackets slung across the shoulders - especially leather jackets, which don't have the drape to do it right anyway - but the rest of this is divine. 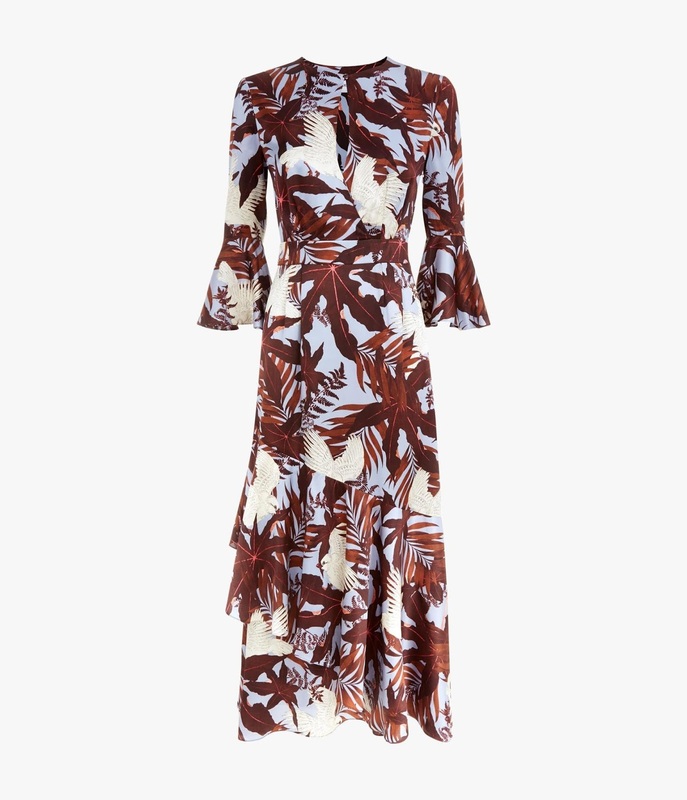 The dress is feathers but the top makes me think of mermaid scales and I would be entirely here for Princess Beatrice deciding to go into mermaid mode. A+. Princess Eugenie brought her fiancé, Jack, who frankly could use something more interesting than a business suit to wear when his date is going to be so sassy. SASSY. Oh, I like it. This top is gorgeous. I'd scoop one up for myself, had I a spare thousand bucks and a Serpentine party to go to. But do me a favor next time, Eug, and Just Say No to Barbie feet. Princess Beatrice is soaking up all the arty summer parties she can - can't blame her for that - by attending the V&A Summer Party last night. GIMME THOSE SHOES. She's wearing a dress too. But gimme. those. shoes. The Givenchy dress may not be much more than a shrug for me, but the hat's a strong YES. Ascot is precisely the place to go to get your Dynasty on, so this sculptural number from Philip Treacy is *chef's kiss*. My favorite from the royal crew on Day 1. Sophie's outfit gets a meh-but-YES from me, too. 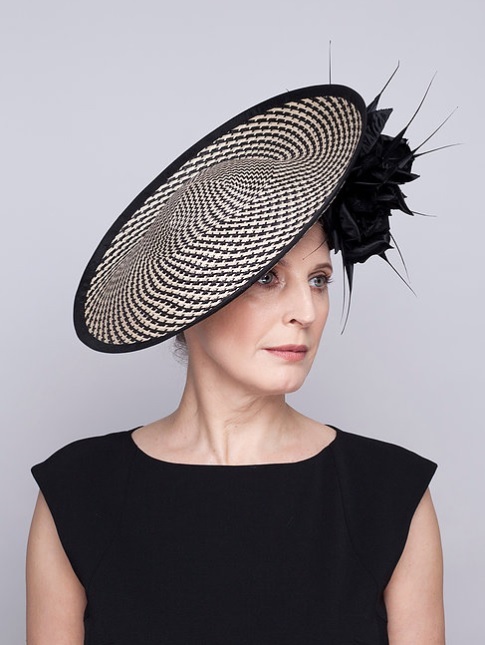 The dress, a new one from Emilia Wickstead, is okay; I think the variation between the heavy black trim on the dress and the light trim on the Jane Taylor hat is what's giving me the mehs. (Two days in a row I want her to go all black with the accessories, maybe? At least I'm consistent.) (Until tomorrow, probably.) Her brooch, on the other hand, is a debut and it is a delicate diamond rose and it is soooo lovely. 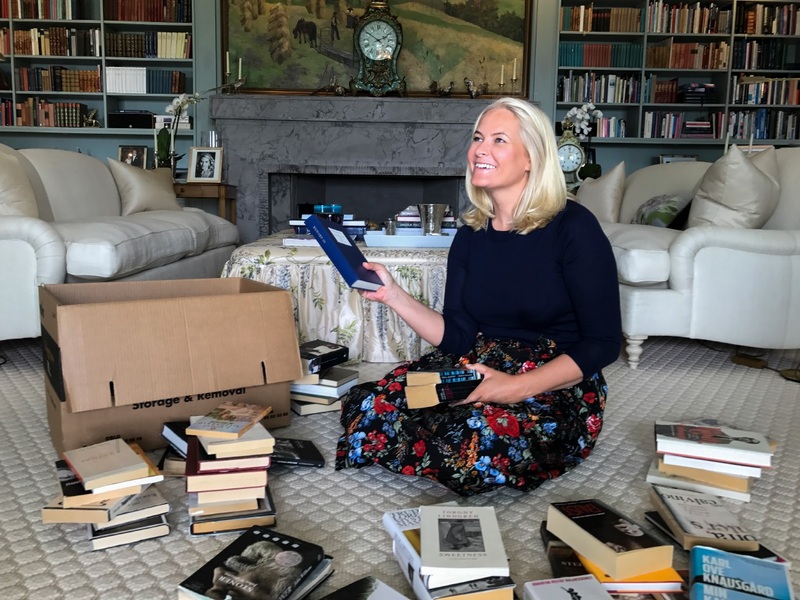 It's similar to a few in the Queen's collection, although I don't recognize it as one we've seen on Her Maj. Get a lot of use out of that one, Sophie. Pretty please. I do so love it when the York sisters turn up in a pair of winning outfits. Both taking the monochrome approach to hats n' dresses (plus neutrals for the accessories) paid off here. 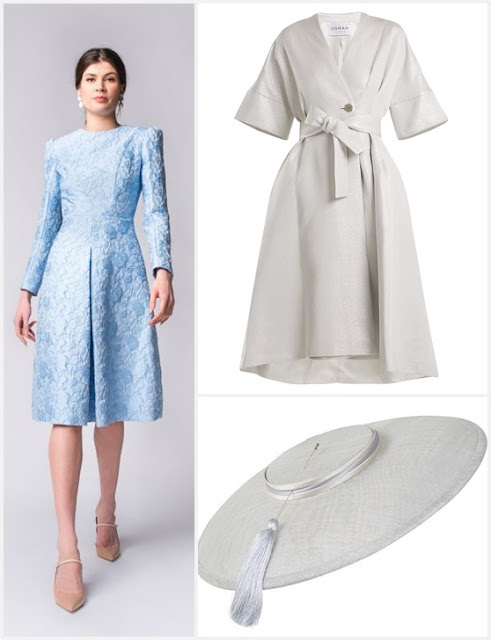 Beatrice's Claire Mischevani dress is a rich jacquard, paired with a matching hat from Juliette Botterill. Eugenie brought a modern feel to the racecourse in a coat from Osman and hat by Emily London. Somehow even the rogue graduation tassel on Eugenie's hat works, this is some kind of sorcery. Am I a big fan of this pale gold on Camilla? I am not. I don't think it's her best shade. Would the shape and details of this dress and hat be divine in another color? They surely would. (The dress is by Dior.) She also could have taken a bigger version of her trademark pearl choker here, I think; she's opted for a standard pick, her Four Strand Pearl Choker with Small Diamond Clasp and her Everyday Pearl Pendant Earrings. Princess Haya, here with husband Sheikh Mohammed and kids Sheikh Zayed and Sheikha Jalila, combined the York color strategies. The Philip Treacy hat's the standout here, with a large flower on top and flowers underneath in the back. Interesting enough for Ascot without going overboard. My second fave chapeau for Day 1. Speaking of going overboard, this hat seems ready to jump right out of the carriage at any time. I feel like she needs a chinstrap just to be safe. Well, Ascot is as much a place for hats with a mind of their own as it is for Dynasty throwbacks. Who's taking home your awards for Day 1? Ah, Garter Day, the one day in the royal year when a dramatic velvet cape and a jaunty feather in your cap isn't just desirable, it's mandatory. On Garter Day, the Queen gathers the Knights and Ladies of the Order of the Garter, the oldest and most senior order of chivalry in Britain. Appointment to the Order is the Queen's gift and up to 24 Knights Companion can be members at any time. Two new members were installed yesterday, Dame Mary Fagan and Viscount Brookeborough. The members wear their Mantle (robe) and Bonnet (hat), along with the Collar and Great George of the Order of the Garter. (See the links for more details.) No one's mantle is more impressive than Her Maj's own, which requires two pages to manage. It's no surprise that she chose to ride in her car rather than walking to St. George's Chapel with the rest of her crew yesterday. As always, she and her enormous earrings - Queen Mary's Floret Earrings - have already been covered at the Jewel Vault. The royal ladies supporting their Royal Knight husbands were the Duchess of Cornwall, the Countess of Wessex, and the Duchess of Gloucester. While Camilla's sharp black and white outfit is new, the hat has been worn with a navy and white outfit in the past. I don't see a huge color difference and yet I don't like the crossing of the navy/black streams even in theory. Sophie's remixing her repeats again, including another hat redo. She added some festive frippery of her own to this chapeau and tied in the black from the dress. The dress is an Emilia Wickstead landscape print with horses galloping through it and I gather the print is even supposed to show an abstract Windsor Castle view. A frock with a built-in wink, of course I love it. 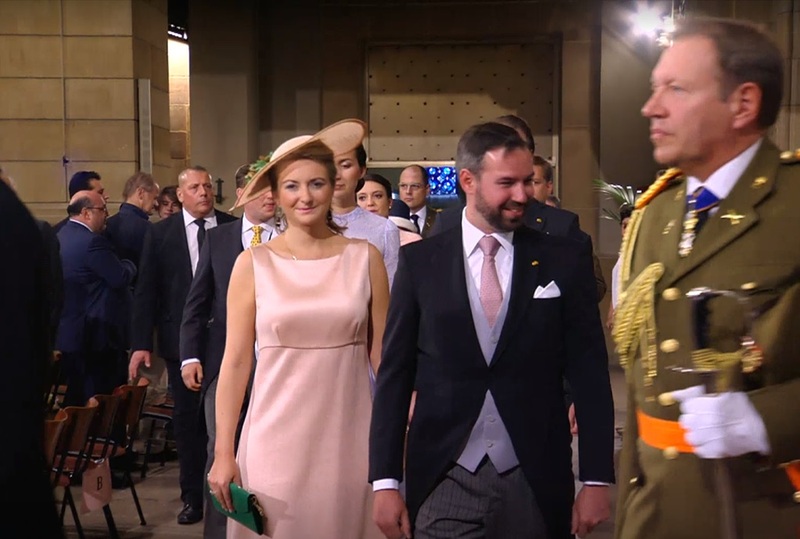 The Countess was my favorite royal wedding guest when she debuted this dress in Luxembourg in 2012, with a black belt and black accessories. Much as I adore her remixing, I'm thinking we need to bring back the black. No? 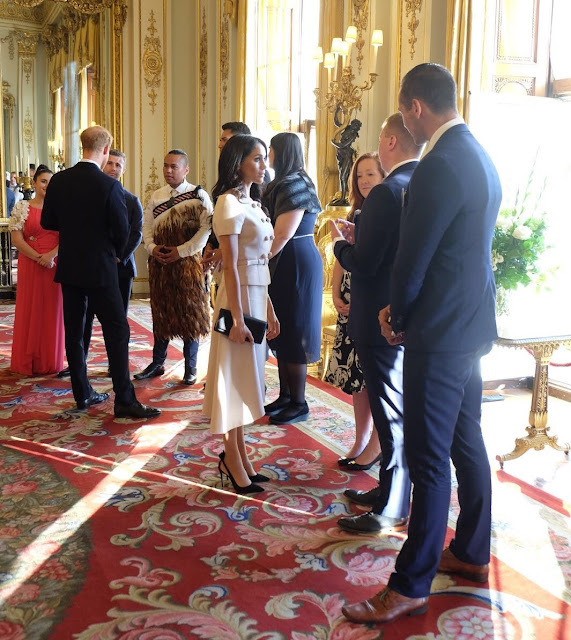 --Over at the Jewel Vault, we covered the Queen's day out with the Duchess of Sussex, as well as a weekend outing with - shock! - no brooch. --Prince Nicolas turned 3 on June 15, so of course we have a new picture of the birthday boy. 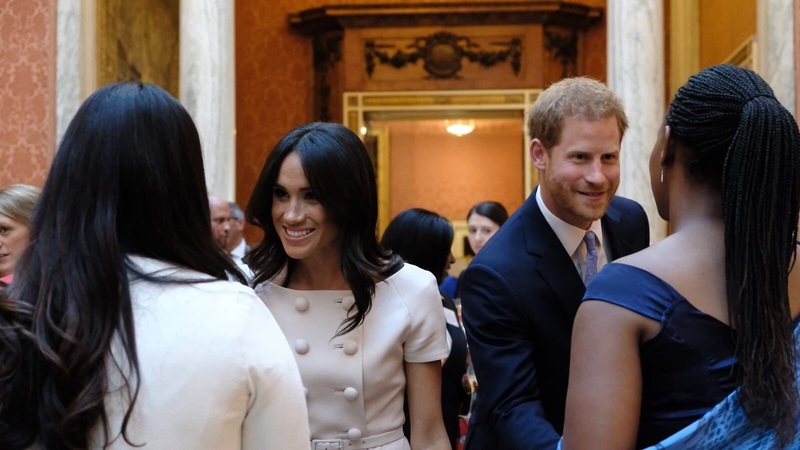 Psst: Looking for coverage of the Duchess of Sussex's big day out with the Queen? Click right here. The Polar Music Prize was awarded yesterday, to the Afghanistan National Institute of Music and Metallica, with the Swedish royal family in attendance. 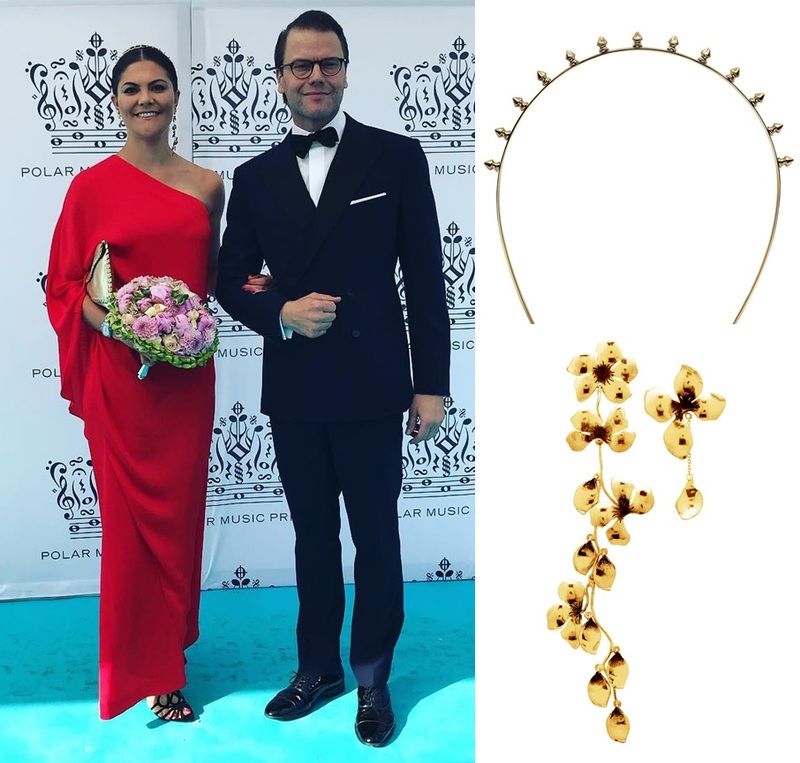 Crown Princess Victoria is usually the one to watch at this event, according to me, because she often uses it as an opportunity for some "edgier" garb. Sometimes that strategy works for her; sometimes it doesn't; sometimes it just proves that even the "edgy" side of a royal wardrobe is, in fact, not very edgy at all. Let 2018 go down as a year where that strategy netted her both the first and the third results: this red toga-style Stylein dress may not be too much of a stretch, but it really works for her. That's a stunning look! 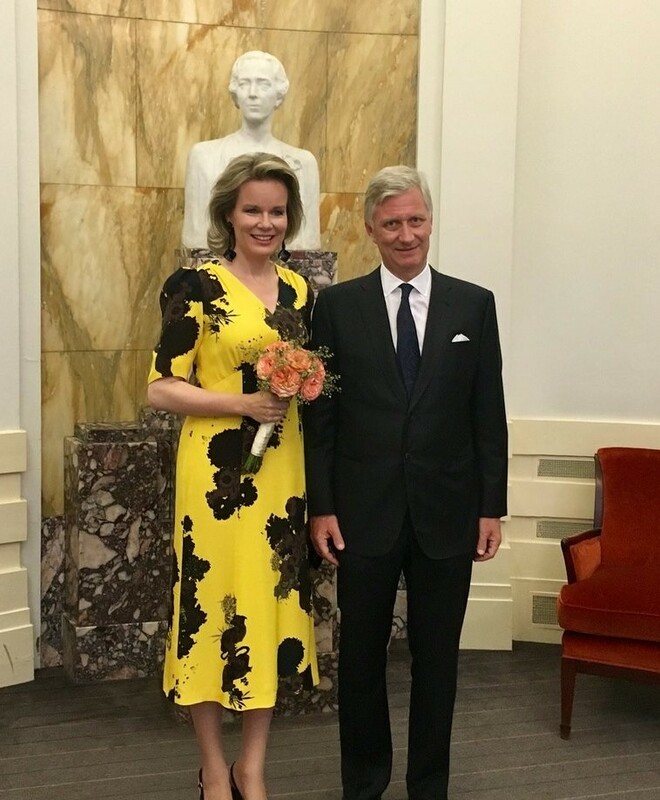 I did want to find a picture to share where she wasn't holding the bouquet, though, because tucking her clutch under her arm messed with the sleek lines. That's my caveat #1. Caveat #2 is her black strappy shoes, a clunky end to an outfit with otherwise gold accessories. Those gold accessories included jewelry from Maria Nilsdotter. The Cherry Valley earrings have one longer earring and one shorter one, a great play to balance the one shoulder on the gown. Victoria also wore the Spike headband, which at first made me wonder from far away if she'd worn her 18th Birthday Tiara for some unknown reason. 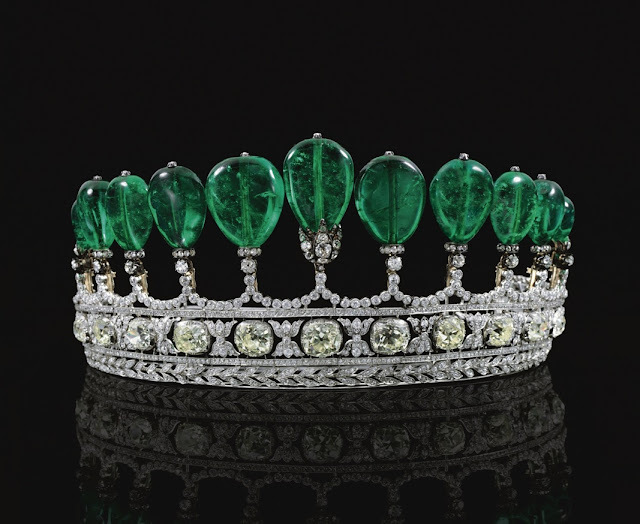 (That was enlightening, because I learned that there is one occasion on which I wouldn't mind seeing that thing, and that occasion would be a non-tiara occasion.) The gold, of course, was a better match. 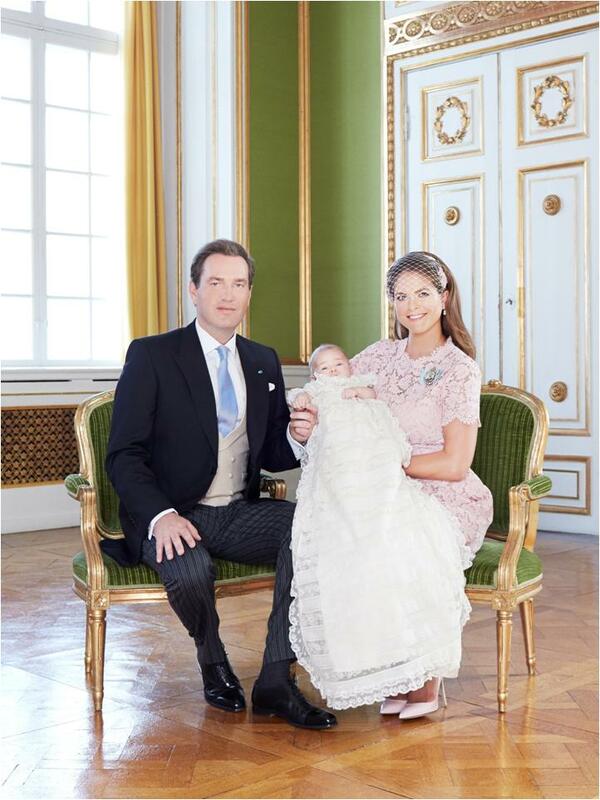 Meanwhile, Princess Madeleine's Giambattista Valli dress is stepping all over Crown Princess Mette-Marit's signature territory (M-M, I can only imagine, either has this one in her closet already or will be swiftly making some calls), and Princess Sofia is knocking it out of the park. Knocking it out of the park, I say! She's really proving this week that green is her color. And that a halter neck is her neckline. And that statement jewelry is her best accessory. I'm surprised at how much I love this whole thing. I might be making a note for the best of 2018. Let's not forget about Queen Silvia, of course, who wore a tidy black skirt, evening jacket, and pearls. We can always count on her to add a final stately note to the family group. Princess Sofia attended the Sophiahemmet University's graduation ceremony yesterday. I daresay Sofia's come up with one of her best outfits for the year. It's described as a "modern take on a Forties tea dress," and I'm loving that little bit of retro flair on her. Plus, of course, the vibrant green. So bright and fresh. That's a winner. I won't be shocked if it turns up in another royal closet or two later on, plenty of them wear L.K.Bennett. King Philippe and Queen Mathilde attended a concert for the Queen Elisabeth Competition on June 4. This repeated Dries Van Noten dress from Mathilde definitely shares the same sleeve feel and a similar hint of retro, no? I can't help but love this on her. Even though it stole its color scheme from a bee. 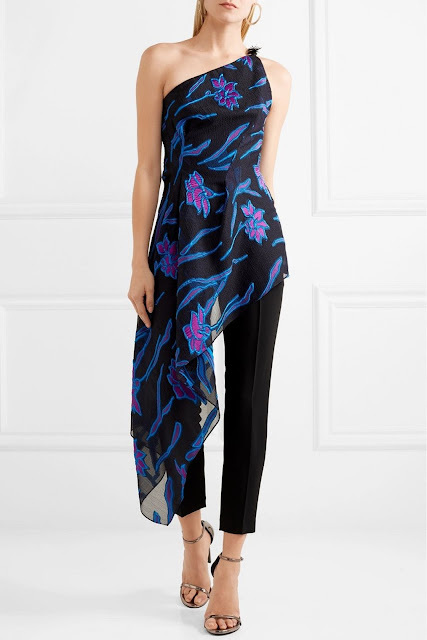 And even though that floral print is definitely trying to Rorschach test us all.